This indefinite delay is all the more interesting considering that UC couldn’t wait to publish the results of its 2015 study that claimed fracking was causing significant air pollution in Carroll County. That study appeared in Environmental Science & Technology just three months after it was completed. UC’s rush to publish its air study while it dawdles for a year in publishing its groundwater study finding no harm from fracking is even more interesting considering the results of both studies were first announced at events hosted by Carroll County Concerned Citizens (CCCC), a well-known anti-fracking group. The same professor that presented the air quality study results to CCCC, study co-lead author Dr. Erin Hayes, has also participated in other anti-fracking events. The retraction of the Carroll County air study comes as no surprise to Energy In Depth, which pointed out its many flaws last May. Not only were the study participants recruited by an anti-fracking activist group, the researchers did not use random testing, did not account for sources of Polycyclic Aromatic Hydrocarbon (PAH) other than oil and gas activity, and assumed worst case scenarios in their cancer hazard assessments. A Carroll County landowner also informed EID that some of the highest PAH levels detected by the researchers were collected on his property, which is more than 10 miles from the nearest shale gas well. 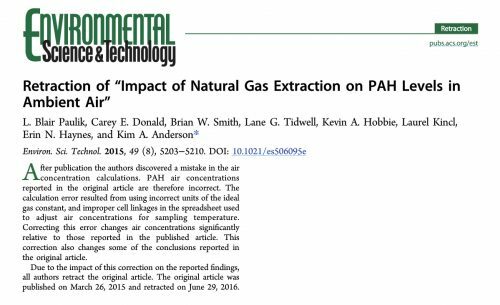 This completely refuted the researchers’ summation that high PAH levels correlated directly to close proximity to shale gas wells. 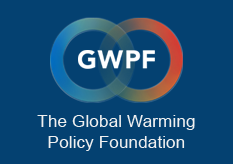 That didn’t keep several media outlets from accepting the authors’ conclusions as gospel with such headlines as: “Fracking may cause air pollution, respiratory issues” and “Fracking could increase risk of cancer, new study finds.” This is a prime example of a rushed study, designed to scapegoat fracking, that fails to fully vet the data collected — yet garners media coverage anyway.